Dark shadows may be creepy, but it’s the sound of creaking floorboards overhead, an unearthly wail (or is it wind?) from the surround channel, and the sudden crack of thunder that really tingles the spine and makes us start when watching our favourite horror. Creating the sound design for chillers is an art that all home cinema fans will appreciate, and few audio engineers are as good at it as Trevor Gates. An experienced sound editor, Gates has worked on a series of goosebump-raising modern horror movies including Get Out, Gerald's Game and Don't Breathe. Most recently, he won the Emmy Award for Outstanding Sound Editing for the cult TV show Atlanta, specifically the horror-inflected episode Teddy Perkins. When you were working on Get Out did you suspect that it would be a breakout hit and critical success? I had a feeling. I kept telling Jordan (Peele, director/writer) that something was going to happen, that Get Out was going to be a thing. I was completely overwhelmed the first time I watched it. Turns out I was right. Are there any sonic elements in Get Out you’re particularly proud of? Sequences that HCC readers should listen out for? I’m definitely proud of the way the Sunken Place sounds. That was an otherworldly composition, for sure. And I think we did a very good job of being quiet and articulate throughout the movie. At first glance, Atlanta is very different from your genre movie work. It’s mainly a TV comedy after all. Did you approach it differently, or is the art of sound design largely the same regardless of genre? It was a bit different, but I felt like I knew what I wanted to do sound-wise going into it. I wanted to feel real, authentic, but specific and heightened when appropriate. With that said, Atlanta was very different from episode to episode. There were always new challenges, and every episode had a focus that needed to be explored a bit differently than the last. What’s really fun about this job is that we are in the business of telling stories, specifically with sound. Although sound design can be very different from genre to genre, the approach has the same fundamental semantics at its core. A lot of it has to do with timing. What do we want to hear, and when do we want to hear it? I believe this is universal, and extremely crucial to sound design. In the horror genre we can find times to create surreal sound, like the Sunken Place in Get Out. That was a soundscape that was completely imagined. Or in Ouija: Origin of Evil, we created pace through quiet scenes with a clock that was never seen, but a completely real and ordinary sound. In Atlanta we used a perceived silence in the Teddy Perkins episode to drive the tension between Darius and Teddy. We built a gun fight in the 'cold open' of [Season Two episode) Alligator Man, and creatively designed gunshots, ricochets, falling pots, pans, and glass to drive the chaos and the threat of something that could potentially be so very real. All those sounds were designed to live in a specific space and time to give you a visceral experience. And throughout the season we built background ambiences inside and outside locations to make you feel like you were right there with the characters, but without distracting you from story and dialogue. It’s a fine balance of sound in time. What do you want to hear, and when do you want to hear it? I was very excited to hear of our nomination. I think I have a fantastic team of sound people that work for me, and I hold high expectations for the work that we deliver. And this is definitely one of those moments where I feel that good work didn’t go unnoticed. I’m very thankful for that. When [director] Hiro Murai and I discussed the sound for Teddy Perkins, we decided that we wanted this episode to hold silence; to be quiet. We wanted to hold people in a cold house, feeling the awkward tension between Darius and Teddy. We also wanted to feel the detail of everything that was happening in this perceived silence, like the globe spinning and the gross ostrich egg. The sound of footsteps in the space, music echoing through the rooms… Every soundscape in this episode was carefully crafted, and because it was a ‘quiet episode’ we had to be very articulate; we had nothing to hide behind. Horror, more than any other genre, relies on audio to convey atmosphere. And in many cases, it's the absence of sound which is the most frightening. How do you approach this? I’ve found that the most effective approach to making an atmosphere quiet is not the absence of sound, it’s the isolation of sound. You give the audience one small audible sound to lock into – even if it’s barely audible, you’ve done your job. And to be clear, this can be very difficult. Because the sound has to be the right sound, and you only have one, so it better be good. We did this with the cold air of the house in Teddy Perkins. I did it with the clock in Ouija: Origin of Evil. I’ve been known to use a single cricket, or a fridge hum, or a knocking pipe. If you can hold someone’s attention with a single sound, you have a lot of power in what happens next. Weird or interesting audio is always exciting. Eraserhead is a great example of otherworldly sound design. What other genre classics have interesting sonics? It’s true, David Lynch has always made some bold choices in sound. And I always admire bold choices, even when they are not otherworldly. One of my favourite sound scenes from a classic is in Stanley Kubrick’s 2001: A Space Odyssey. Right before HAL takes over, as Dr. Frank Poole is performing maintenance outside the ship, there is an even minute scene where the only things you hear are the breaths of Frank, and the hiss of an air hose. I think this is bold, and very cool. The jump scare has become a cliché in modern genre movies – quiet, quiet, BANG! How do you feel about that? I think this is a powerful tool that is often abused. We often find ourselves experiencing a jump scare that is forced; something that wasn’t really composed to be scary, but leans on a loud sound to frighten the audience. It’s a cheap trick. But that doesn’t mean that all jump scares are cheap. One filmmaker that I continue to work with who does a fantastic job with the jump scare is Mike Flanagan. One of the most memorable jump scares from a film he and I worked on together didn’t even have a loud sound for the jump. On Oujia: Origin of Evil, we are on a quiet shot of a hallway, then cut to little possessed Doris leaning over the shoulder of one of her family members speaking in tongues/ whispering. There is no loud bang, but in the theatre, the audience had a visceral response. They effectively provided the loud sting. Yes. Mike has some good tasteful jump scares in there for you! I don’t want to give anything away, but I’m very proud of this work. It’s a great story, with some very interesting sound. You’ll definitely get your fair share of dynamics here. A lot of quiet followed by loud. I wouldn’t hesitate to recommend this series. We think it’s fantastic. It’s all about being specific and being bold. It doesn’t have to be a weird sound, but if you can make some great choices, you’ll have a very creepy atmosphere just from the minimal selections you’ve made. You often hear the term ‘less is more’, well in the creepy atmosphere world, this is absolutely the truth. For Oujia we built a very creepy sound world when Doris becomes possessed: clock, footsteps, breath, and demon. Originally the possession scene had score throughout, but we did such a stellar job of making it creepy, the director decided to take out the score and play it only with sound design. We often hear that directors, cinematographers and colourists will agree a tonal palette for a movie? Is there an equivalent consensus on audio? TV and movie audio has evolved rapidly from stereo to 5.1 and now immersive audio with Dolby Atmos. What do you think Atmos brings to the movie/TV experience? I think the Dolby Atmos experience is absolutely incredible. It’s such an immersive experience. We just mixed The Haunting of Hill House in Dolby Atmos. The clarity and depth of the mix in that format is something unique and incredible. The separation of sound, through whatever is happening at any given moment, is unparalleled. 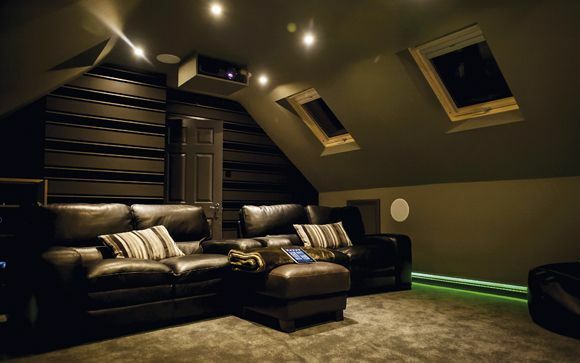 Can you tell us a little about your own home theatre? I have a 5.1 surround sound home theatre. I have a Yamaha receiver with all Klipsch speakers, and a 75in 4K LCD TV. After working on The Haunting of Hill House in Dolby Atmos, it is on my to-do list to upgrade! What examples of movie or TV audio have inspired you? Can you cite great examples of sound design? Who are your industry heroes? Let’s see... Nature sounds and Foley: Cast Away. Gun fights: Heat, Black Hawk Down. Sword fights: Kingdom of Heaven, Gladiator. Anything Edgar Wright (huge fan). Anything Pixar. Recently: Arrival and Annihilation – those were very cool-sounding tracks. Sunshine, Alien, Blowout... I realise that list is eclectic, and I suppose the list could go on, but those are a few.